For me, when I started out in Airsoft one of the big questions was 'What eye protection should I use?' and as there are an abundance of different materials, shapes and sizes to choose from it can be confusing, and horror stories from seasoned airsofters definitely do not help! 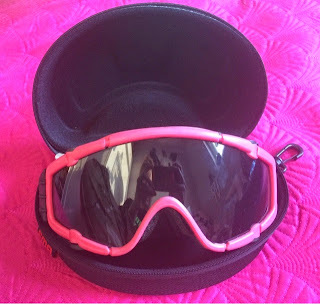 This article is going to look at the types of eye protection I have personally tested, but eye protection is a very personal choice and I encourage you to experiment and find what works best for you! When I first started airsoft, I picked up a pair of wire mesh goggles for £6.99 on eBay (pictured on either side!) Not the cheapest of the cheap but still cheap enough for it not to matter if I didn't like Airsoft and I didn't use them ever again. I still have these and use them occasionally because I like them so much. They have passed the safety test of being shot with a 450 FPS Sniper Rifle at Point Blank range which is good enough for me. They're lightweight with an adjustable elastic strap and fit nicely with my half mesh face mask. I've had these since August 2014 and wore them to every skirmish except one and they have lasted fantastically. I've seen a fair few people on the field with great big dents in their mesh but I have taken these to both Woodland and CQB and they are yet to receive any marks or dents. One of the big advantages these give you is that they will never fog! The only downside is that they aren't as safe as Perspex goggles. The holes in the wire mesh mean that if a BB hits your goggle and shatters, the pieces of polymer could pass through the mesh and collide with your eye, which could potentially leave you blind. The other, less serious danger is that if a BB hits your googles, dents them and chips some of the metallic paint on the inside of the goggle, that could go into your eye. I am very fortunate that this has never happened to me so I have no qualms about using these sorts of goggles. The only thing I have experienced that comes close is a BB shattered on my half mesh face mask (pictured above) and pieces of polymer broke the skin, ouch! I have been told that for some people mesh gives them a headache, so it's really an individual choice! 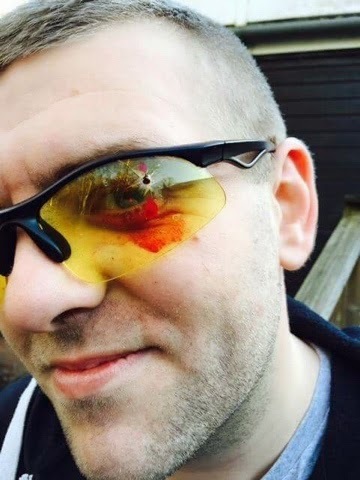 At the start of this year, I saw this picture circulating the Airsoft community of a gentleman who had been wearing some cheap shooting glasses for a skirmish and the BB passed straight through the Perspex and very nearly blinded him. Luckily, and thankfully enough he wasn't seriously injured! (Thank you to Ambush Adventures for letting me use this picture!) This just goes to show that when it comes to eye pro, it really is worth investing a good pair of googles. After this, I felt a little concerned about the mesh goggles I was wearing so I brought a pair of X400 goggles at £9.99 from an online Airsoft store (I can't remember which site but you can pick these up on eBay for around £5) but I can honestly say, that hand on heart they are the worst goggles I have ever used and I do not rate them at all (But I have heard of people using them with no issues so they may simply not be for me). They have passed safety tests of being fired at point blank range with a high FPS AEG (that's the line I got from the seller) but although they are lightweight, have an adjustable strap, they're clear and they come in 3 different colours. They, no matter how much I adjust them are too tight around my cheeks, so I end up with red pressure marks and they make my cheeks look puffy, the goggle lenses fog up like crazy even though they have vents (This could be solved with anti fog spray so I am told). They also just look horrendous on my face. The X800 shape though, is much improved and I would be really interested to give these a try! Firstly, they are gorgeous! 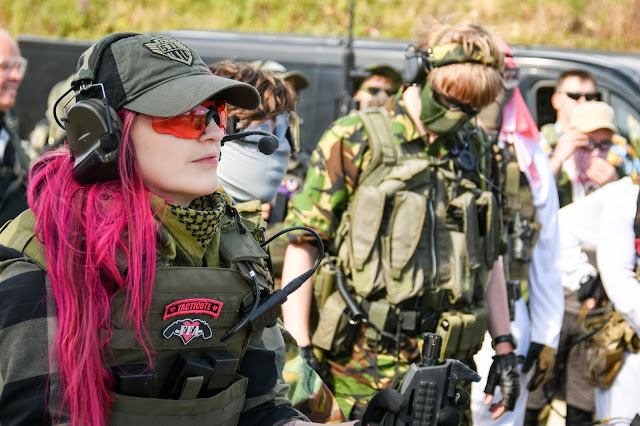 Please excuse the reflection of me in the goggles haha The colour is great and goes well with the other pink items I have on my loadout! They are made from polymer and rubber and they make a sturdy set! 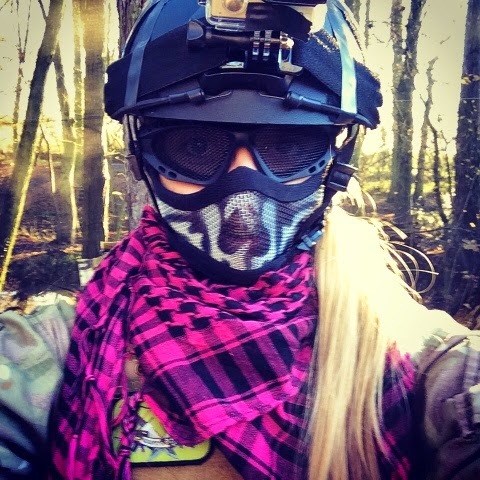 They are a very large pair of goggles so protect a lot of my face and it overlaps my mesh face mask so there's no exposed space on my nose like I get with other goggles - I do not ever want to be shot on the nose after seeing so many Airsoters get their noses split open! What I really love about these goggles is that they have a fan inside above the right eye to prevent them fogging, I used them for the whole day on my last skirmish and didn't have any fogged lenses, good stuff! The fan runs on 1 AA battery that sits in a chamber on the elastic strap. It does make a slight buzzing noise when on, but you can't hear this in normal game play. The goggles do drain batteries very quickly as well, which is annoying but 1 battery lasted the whole day. The battery chamber is seriously bulky, so if you run a helmet like me you'll need to wear the goggle strap over your helmet as it won't fit inside. The goggles come with a tinted set of lenses already installed (pictured above) and a clear lens as well. 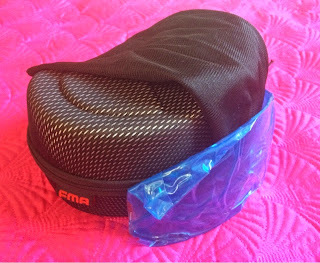 One thing I was really, really impressed with was the packaging the goggles came in! Sounds weird I know, but it came in a lovely case with a slip for them to keep them safe during transportation! Fabulous! The product does not offer ballistic eye protection and using it for such purposes is not in accordance with its purpose! Stress trials have proven that lenses show visible dents, scratches and even cracks (also of frames) after being shot with a BB bullet. 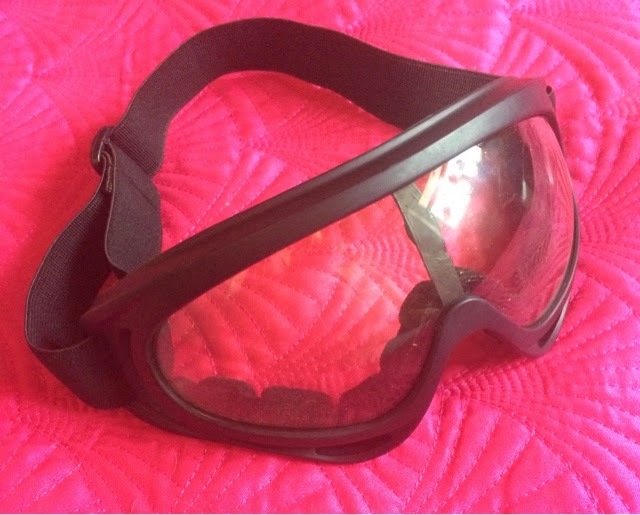 The manufacturer and vendor do not bear any responsibility for the usage of this product as eye protection during games with Airsoft replicas and possible damage to the User’s health or property, thus the product cannot be advertised on this account"
...now, surely if you're selling a pair of goggles on an Airsoft website, they should be safe to use in Airsoft?! Well you would think so but apparently not! I however used them in my last skirmish and had a few BBs hit the goggles and they have caused no damage, there isn't even a mark. So take from that what you will! Haha! I think they're a really sound pair to use. In conclusion, eye protection is very much dependant on the wearer. I fully encourage you to go out, try what you can afford and see what is best for you. I personally love the look and feel of mesh but due to the dangers mentioned and my love of CQB I will rock the FMAs until I find something better :) I hope this was useful for you all! If you have any thoughts or suggestions on goggles that I should try, leave them in the comment section below! Hi Kelly my name is Daniel and i´m from Portugal. I´m currently considering to buy these goggles, in black that is :), but after reading the warning on the Gunfire site i´m backing up a bit. What’s the point of sealing Airsoft safety goggles if they can’t protect your eyes from a simple BB ? Can you recommend these goggles concerning Airsoft safety? and what do you think of the anti-fog system?